$300/NIGHT OFF any available dates for the month of April! 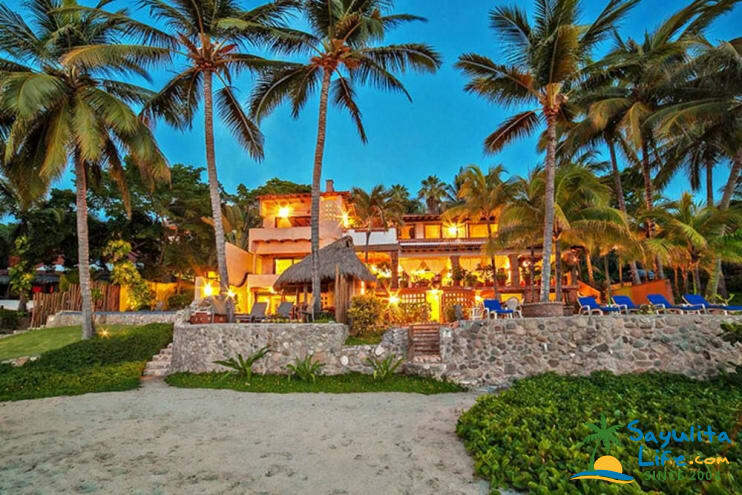 Gallo del Mar in Sayulita is a beachfront property with two private homes separated by a large privacy wall. For large groups of up to 16 guests, this can be opened up and your enitre group can enjoy 7 bedrooms, 6 baths, with two pools, all just steps from the beach on the sought after north side of Sayulita. The amenities at Gallo del Mar are abundant and include two swimming pools, one larger pool and one smaller dipping pool. Direct beach access, two fully equipped kitchens, private parking, daily housekeeping, safes for your valuables, WiFi, telephone, beach chairs and beach towels. Need less space for a smaller group? We have two options: Both homes are completely private and self contained, and are separated by a large privacy wall. Casa Gallo is 4 bedrooms, 3 baths, private pool, and accommodates 10 guests. You can view our Casa Gallo rental page here. Casita del Mar is 3 bedrooms, 3 baths, private dipping pool, and accommodates 6 guests. You can view our Casita del Mar rental page here. Please use the contact form to get in touch with any questions and to request a reservation. We look forward to welcoming you to Sayulita! Please note we offer accommodations only and do not host weddings or events. Great house, great location, great staff. We had 6 adult couples and couldn't have picked a more perfect place. The sunsets, the sound of the surf, the large covered porch, the outside sitting area by the beach, the short walk to the village along the beach or the street, made Casa Gallo the perfect place for us to escape the cold, rainy weather in Louisiana.Lucy and staff did an excellent job and cooked some delicious meals for us.I highly recommend Sayulita and Casa Gallo for a low key getaway. WOW! Loved this property - was everything we expected and more! In town for a family wedding, with extended family staying in the 2 houses that are attached.. It couldn't have worked better! the houses are fantastic (the beach, the views, the pools, the décor). The houses are well cared for, and the on-site staff (which comes in daily) were so great and unobtrusive. The location is a bit of a walk from town, but well worth the peace and quiet. recommend renting a golf cart while in Sayulita, which makes it super easy to get around. Highly recommend one or both of these houses - just a fantastic vacation! Our own amazing private resort!! We were completely blown away by how huge the common spaces were and how unbelievable the view was from every angle. We rented casa Gallo for one week in June for a family reunion of 11 people and spread out on 3 floors, we never felt crowded. What a luxury to have Biki come and clean up everyday and have Ismael around to take care of the outdoor space. The multiple level pools were so perfect for our kids ranging from 2 to 10 that I have been inspired to try to build one in my yard now! There is a wonderful space with loungers right next to the ocean under palm trees shade which proved to be the most relaxing place to read a book. Overall the experience was Fantastic!!! and I would love to go back year after year! My now-wife and I rented out Casa Gallo + the Casita (the full property) last week for our wedding in Sayulita. It was simply the perfect place for us and a large group of our friends to stay - removed from the hustle and bustle of town, but easily accessible. This part of the beach was my favorite to swim in; the two pools were great to have; the house is beautiful, well maintained, and the staff was excellent. Spending our mornings and afternoons lounging in the many chairs by the ocean was exactly what we wanted. A perfect place to get ready to be married with my wedding party. Highly recommend! We rented both Casa Gallo and Casita del Mar for a family vacation (8 adults 6 children). We had such a wonderful time! The bedrooms are spacious, the kitchen well appointed and the common area so comfortable. There is plenty of space to quietly read or gather to socialize. The pools are small but sparkling clean and very refreshing. The sunsets are stunning and you can enjoy them right from the casa. Literally steps to the beach. We enjoyed the walk into town but also rented a golf cart as we had little ones who found it a bit far. It was handy to have the cart to bring in groceries as well. Lucy, the property manager made a delicious dinner for us one night and even arranged to have a trio play for us! A very special birthday celebration! The staff is friendly and keep the houses very clean. If we are ever back in Sayulita, we would love to stay in Casa Gallo and the casita again. We wouldn't hesitate to recommend them. Go! You won't be disappointed! Views were amazing from most any room in the house. We were in town for our daughter's wedding meeting up with other family and friends for the event. Many were staying in houses near ours. We had a great time cooking in our home and hanging out with the locals in the town of Sayulita. Finding the house with our cab from the airport was our only challenge since he was unfamiliar with the area. But with the help of locals, we found our home with Lucy waiting patiently to greet us and show us around the house. The house was very clean and taken care of daily. The staff was very helpful with anything we asked about. The owner was also very easy to work with to arrange our rental. You will definitely love spending time in Casa Gallo! My family and I (12 of us) stayed at Casa Gallo and Del Mar the first week of March 2018. From the very beginning AJ and her family were on it! They responded to all e-mails and questions. They made great arrangements for the money. When we arrived at the Casas we were all ill from our travels. The house keeper Petra met us and instantly we felt great! She is a sweet lady! Petra took great care of us even making tea for my grand daughter that was ill still. Previous to this week we had all attended a wedding for my daughter and as many as 30 people were ill that week. What a relief to come to Gallo and Del Mar and relax and just breathe in the air. Jorge was great too and showed us through the Casa's upon arrival. We loved it all and just wish we could be there again! We loved this house so much that we are going back again next year! We can't say enough good things about this place! The plunge pools and ocean views are spectacular! Lucy & Carlos were excellent and everyone else that takes great care of the place. This property is the perfect spot for 7 couples to enjoy private bedrooms and bathrooms. Kitchens to cook great food at the house with plenty of outdoor seating and the best part: a bar! My husband and I and our family rented both Casa Gallo and its adjoining casita for us all to enjoy for a week. We got married on the beach right in front. The property is breathtaking! Its located on the north end, which is nicer and quieter. The casa has a unique and special feel. It's quite obvious that the owners have put lots of love into this place. The staff is fantastic and very trustworthy. The property owners and family were very easy to work with and answered all of our questions beforehand. I highly recommend Gallo del Mar! This was the second time we stayed here and this time we rented both sides, Casa Gallo and the adjoining Casita. There was plenty of space and the views and ocean were spectacular. We spent our days in the pools, on the patios, and strolling into town which was only about 10 minutes from the house. We had complete privacy and the house was fantastic. Every room had a bathroom (with really cool open air showers) and the house keeping staff were wonderful. Can't wait to go back! For your security we accept credit cards via Paypal with a 5% Paypal fee. We also accept wire transfers to our US bank account. THERE ARE NO OTHER FEES OR TAXES. YOUR RENTAL FEE IS THE NIGHTLY RATE x NUMBER OF NIGHTS OF YOUR STAY. There is a $500 refundable damage deposit that is returned within 2 weeks of your stay. Reservations are confirmed once we have received the completed booking form and 50% of the rental fee. Rental invoices are sent by email for wire transfer to our US account or can be paid by credit card for a 5% Paypal fee. The remaining 50% rental fee and a $500 refundable damage deposit are charged 30 days prior to arrival. This Acccomodation is located outside of the immediate sayulita area.